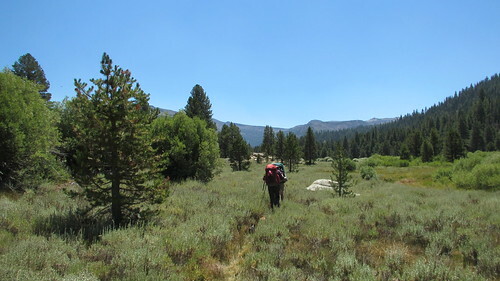 At the beginning of August we backpacked into the Carson-Iceberg Wilderness, a wilderness area in the Sierras that stretches between Ebbetts Pass and Sonora Pass. 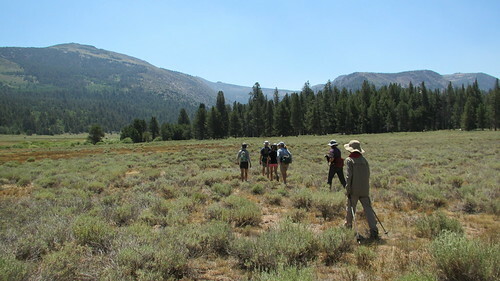 We hiked the east side, an area of high desert peaks, a few isolated lakes, deep river canyons and meadows lush with riparian vegetation, giant trees, and home to the Paiute Cutthroat Trout, the only place in the world where they exist. 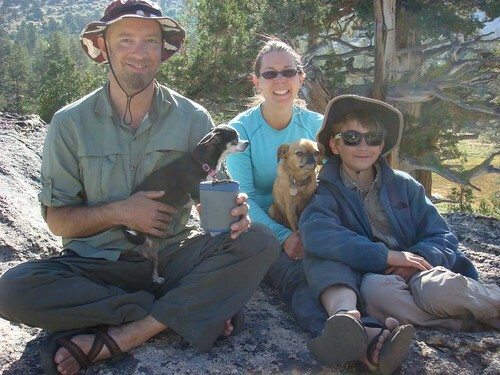 In addition to exploring new country, this trip would also have a couple new experiences for us as well: our first three night outing, and backpacking with another family. We began planning this trip back in the winter. 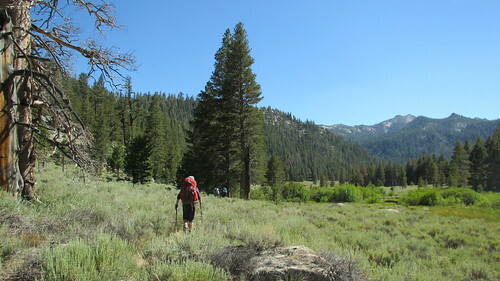 After discussing a few destination ideas, the Carson Iceberg Wilderness was selected as a fun, no-hassle adventure. 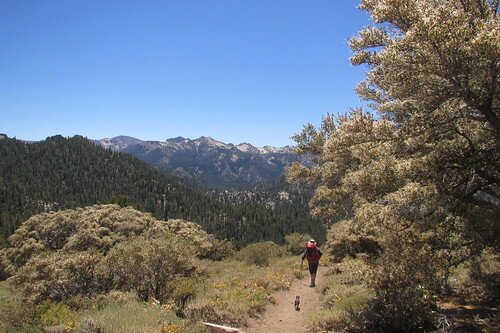 There are plenty of options for loop hikes with no need for shuttling, it’s far less traveled than other wilderness areas in the vicinity, there are no visitation quotas, and permits are readily available at the trailhead. 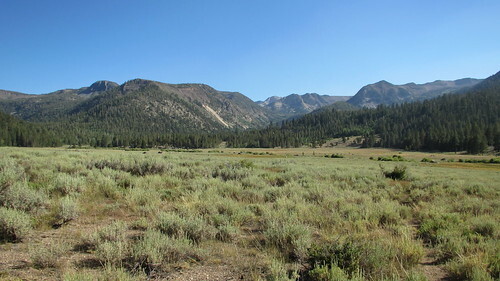 And not only that, Jason, our party leader, was a former backcountry ranger in this area. It would be like a guided tour. The trip sat blocked out on the calendar for months, and then planning began in more detail the week before we hit the trail. Planning for the first new challenge was rather easy. An extra night out really just meant carrying more food. 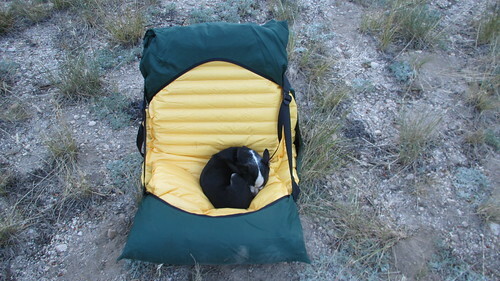 The only additional gear we needed to purchase was another bear vault to increase our food storage capacity for 4 days. 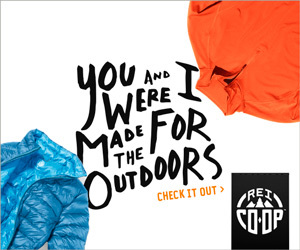 All our other gear remained the same, including clothing. 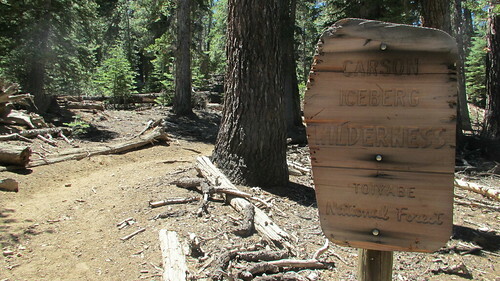 A great Carson-Iceberg Wilderness map was acquired at the Carson City Forest Service station. 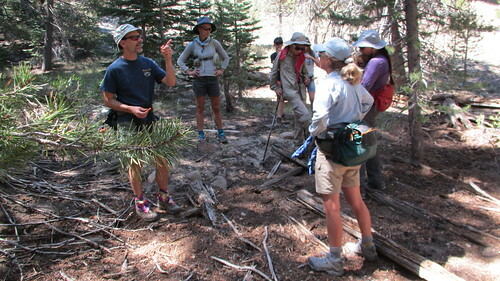 The second new challenge, hiking with a larger group, presented all sorts of new factors to the equation. 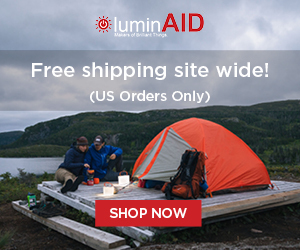 Skill level, hiking pace, daily mileage, meal sharing, area required to setup camp, and other questions would all have to be considered when planning a backpacking trip with more people. Luckily this area went smoothly as well. 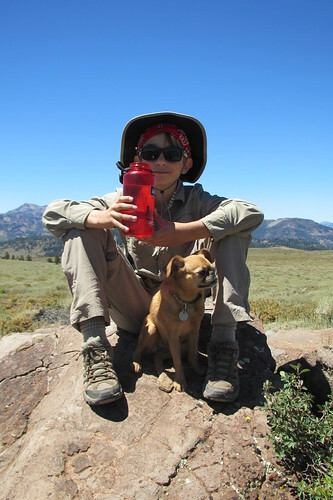 Our kids are all of similar age, and we were able to share gear and meals. 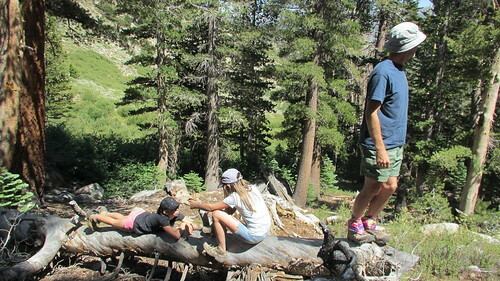 Both families have good backcountry skills, so we were all able to take care of ourselves when independence was needed. Our pace was definitely slower traveling with 2 small dogs, but everyone was patient and encouraging. To get to our trailhead we took Mill Canyon Road, a dirt road that heads west up into the mountains out of Coleville, California on Highway 395. 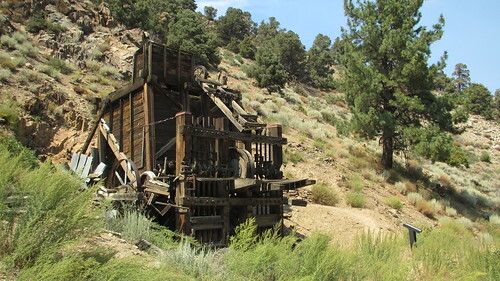 Keeping to the right, the road becomes Golden Gate Mine Road, and climbs steeply up a gravel road for about seven miles to the Little Antelope Pack Station. 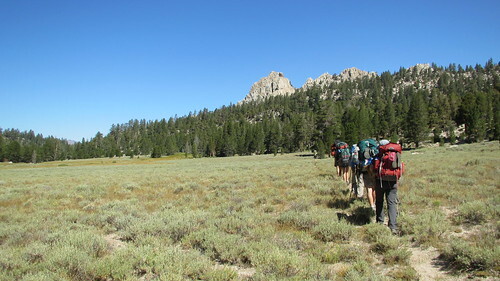 Just before reaching the pack station, we took a left and headed south to a backpackers trailhead parking area. From the trailhead we immediately started climbing to get over a ridge to the southwest along a trail called “The Driveway”. I’m guessing this name comes from the cattle driving days, a path most likely taken to access the high meadows. 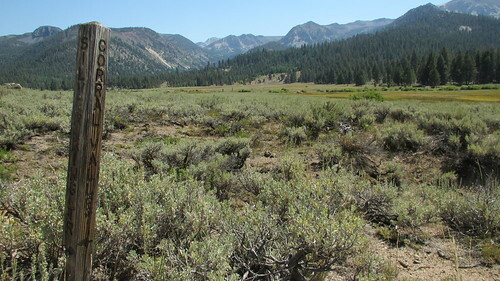 Cattle grazing is no longer allowed in this area to protect the Paiute Cutthroat Trout, so this day we were just driving backpackers. H’Yah! Gaining altitude fast, it wasn’t long before big views opened up in all directions. 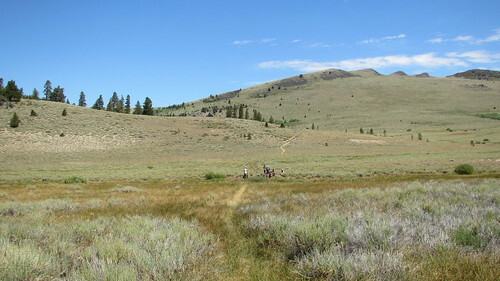 At the top of the climb, the trail levels out onto a wide-open plateau covered in low growing brush. Standing out on the landscape is a large arri mutillak, or “stoneboy”. Not only was this curiosity a great place to rest after the climb, it had another special meaning as well. Jason proposed to his wife Shannon at this very spot nearly 20 years ago. For our dogs, it was just another place where people were handing out cheese and salami. 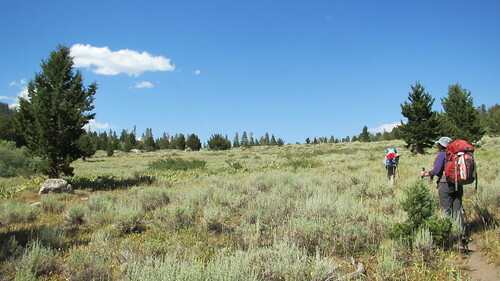 Near the arri mutillak, the trail forks. To the south the trail descends to Corral Valley, the trail we’d be hiking out on a few days later. We continued west though, towards Silver King Creek. 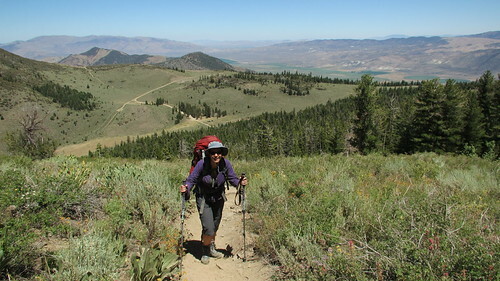 This trail felt long to me, the hillside taking its sweet time to curve and descend to the canyon bottom. My larger scale map didn’t help my perception either, it looked like such a short distance on paper! 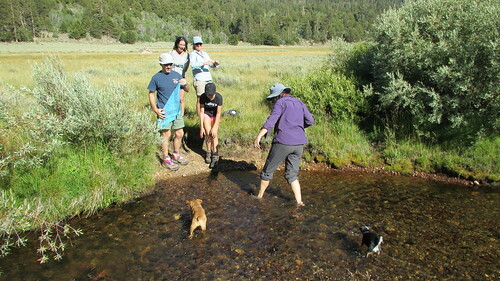 When Kristy, the dogs, and I caught up to the rest of the group, they were already cooling off in the creek. We immediately kicked off our hot boots and joined them. After our break, we turned south and followed the Silver King upstream. 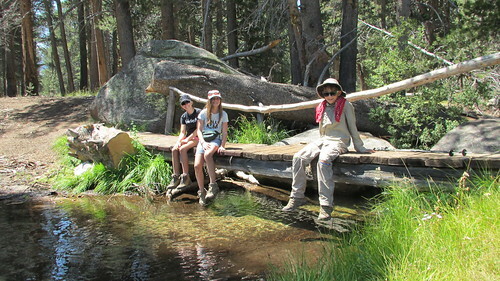 With the plentiful water, the trees grow thick here, and provided us plenty of shade for the next leg of the hike. 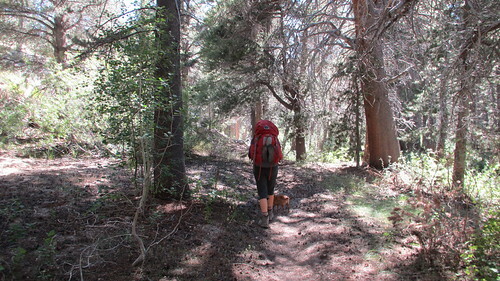 After some hiking through woods and meadows, we selected a campsite in a canyon above the Silver King Creek. 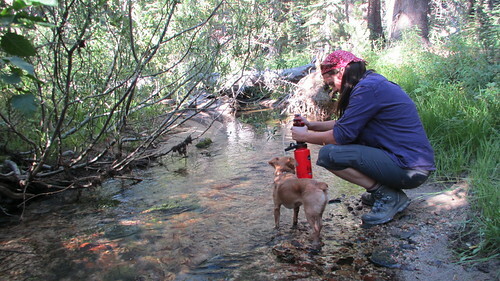 We setup camp, and walked over to a nearby creek to filter water for the night’s feast. 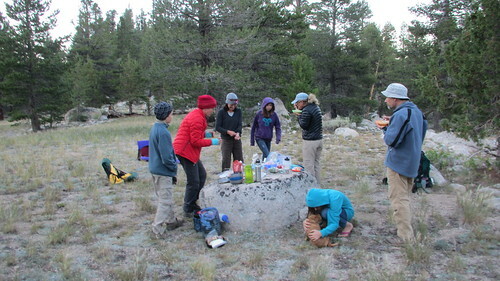 We spread out our tents, but had a common kitchen in the middle, a big flat granite table. It was our night to provide food for the group, so we made on of our backpacking favorites, Ramen noodles with vegetable broth and fresh vegetables. For me, it’s hard to beat a bowl of hot noodles when out camping. Not only are they delicious, but they have a certain comfort to them. A feeling of home in an unfamiliar environment. And speaking of comfort, we also enjoyed a few drinks with and after dinner. We brought two liters of wine with us, and our friends brought a flask of tequila. It was hard to say at that time if it would be properly rationed over the three nights. We also had music at camp. Jason brought a small guitar along, and I had packed a harmonica. Jason played and sang, and my son took over the harmonica duties. The starry night was filled with sounds of the old west. 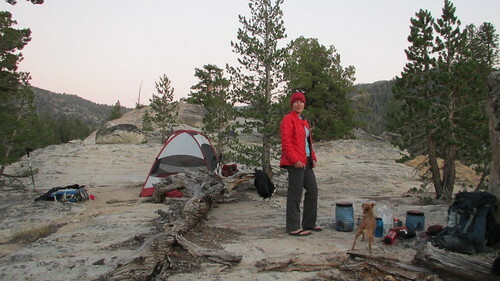 The next morning we set out to do a day hike without the bulky packs, planning to stay another night at our current camp. The destination for the day was Whitecliff Lake, and hopefully Whitecliff Peak if there was time. 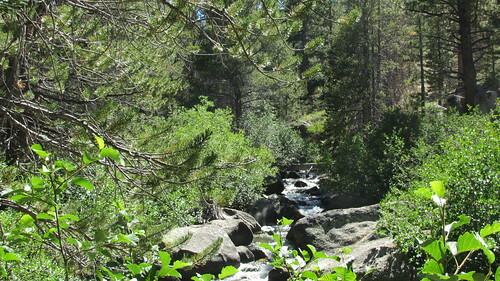 We hiked south, and followed the west side of Silver King Creek, hiking off trail most of the way. 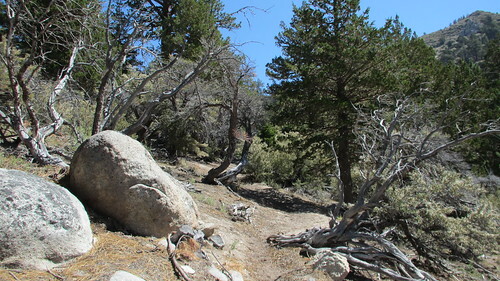 At times you could see remains of old trails, but much of it has gone back to nature now. We passed the remains of an old cabin. You’d almost miss it if it weren’t for some of the discarded metal belongings. One old relic was a square baking pan. There was some debate of what we could do with it. The group splintered into two factions: Those that would bake brownies, and those that saw it as a lasagna pan. Having ingredients for neither, we just imagined stacked cheesy pasta and dense chocolaty cake and moved on. 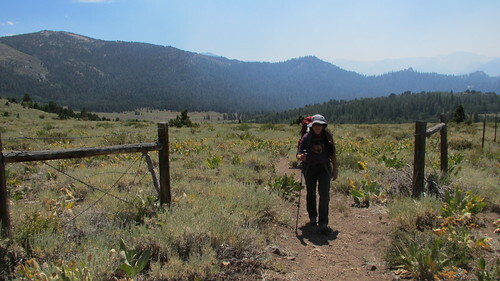 Further up the Silver King we passed the former site of Governors Camp (or Commissioners Camp as some people know it). It is said that Ronald Reagan used to come here when he was governor of California. Finally we arrived at Connells Cow Camp, a cabin now used by the US Forest Service. 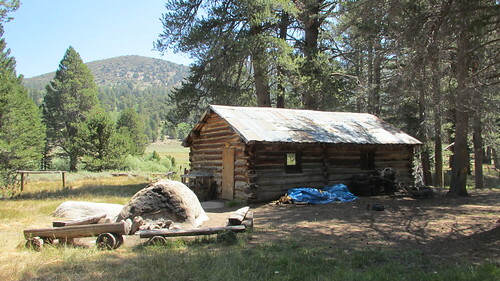 The cabin is locked, but the area around the camp is still inviting for a break. 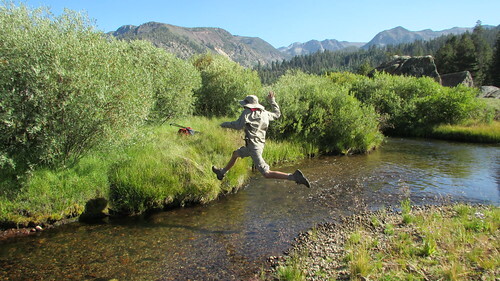 There’s a bridge to sit on and dangle your legs over the creek, and there’s even a complete game of horseshoes to play out back! 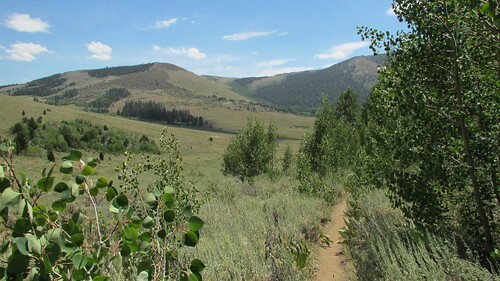 The trail to Whitecliff Lake leaves the cabin to the west. It’s a faint trail at times, but still pretty easy to follow. Our dogs were already kind of pooped by now, having to be carried a lot of the way over the thick brush and pine needles of the cross country route. They hiked when they could, but often gave us that look that begged, “Please carry me! Don’t you know I’m small??”. We continued climbing and climbing. 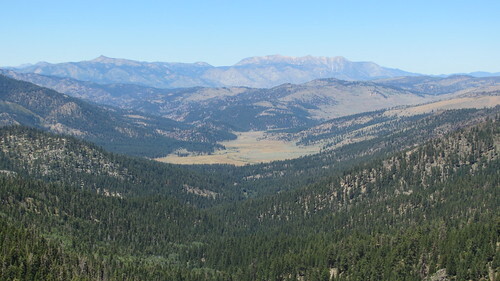 Spectacular mountain canyons came into view as we got higher. The rest of the group had pulled pretty far ahead by now, but we just kept our slow and steady pace. Eventually I heard my son yell out, “Dad! We’re up here!” I couldn’t see him through all the thick trees along the creek. I just waved in his general direction. I could hear the others too, and I imagined them already playing in the lake and enjoying themselves. As we navigated the maze of trees along the creek and got closer to the others, I started to get the feeling we weren’t at a lake. The steep geography and lack of a basin didn’t suggest that there was a large body of water ahead. We finally found the others resting and waiting on the steep mountainside. There was no lake to be seen. Not wanting to stop too much, I hadn’t had a chance to look at my map to see where we were. Apparently there was still one turn in the canyon left, and plenty more climbing. I wasn’t sure how I felt about continuing on. I was pretty sure I knew how the dogs felt about it. We filled the water bottles in the creek, and discussed our options. There were some that wanted to keep going to the lake, and some that wanted to head back down. In the end, we all decided to head back together. We’d have to save the lake and peak for another day. 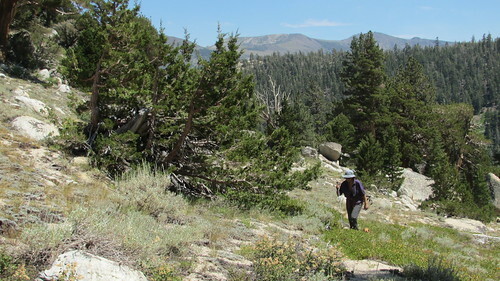 Descending the canyon was much easier, and soon we were back at Connells Cow Camp. 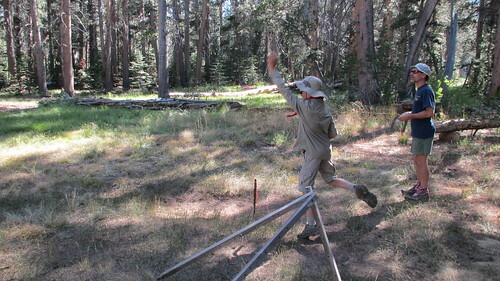 This time we took turns throwing a few games of horseshoes while we discussed what to do next. 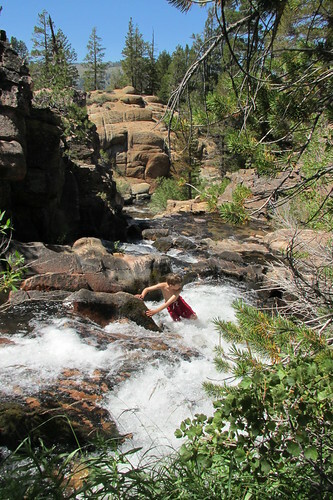 Since we didn’t get to swim in the lake, a dip in Silver King Creek sounded like the next best thing. 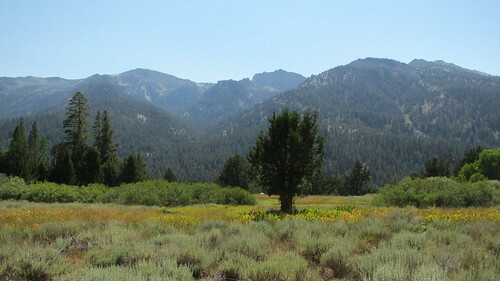 Just to the east of Connells Cow Camp is the meadow of Upper Fish Valley. 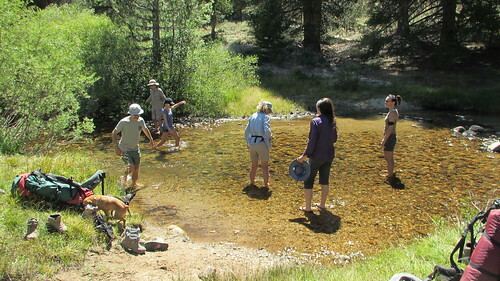 The creek is slow and wide here, and made a good place for a refreshing dip after a hot day of hiking. To return to camp, we stayed on the established trail on the east side of the creek for a much easier hike back to camp. The dogs, feeling a little refreshed now, hiked much of the way back. Camp was fairly quiet the second night. We cooked our own meals and sipped a few drinks. We retired early that night. I read about a page of the book I brought, but then decided to go to sleep instead, falling asleep to Jason playing the guitar across the camp. The next morning we packed up camp and started hiking towards Coyote Valley to the east. 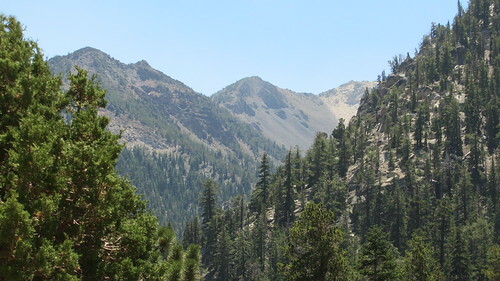 First though, we’d have to hike back to Upper Fish Valley to reach the pass trail. But instead of just hiking through the day, we made an extended stop at Llewellyn Falls on the Silver King. 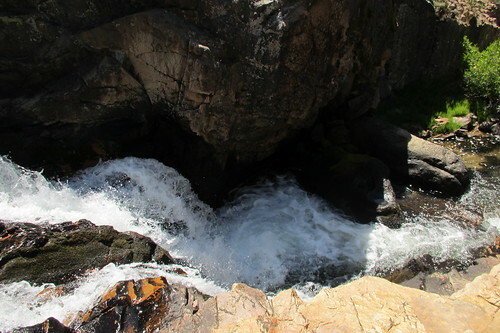 Llewellyn Falls is a section of the Silver King Creek that passes through a steep narrow canyon. There are lots of deep bubbling pools here, perfect for a nice cool soak. Everyone got into bathing suits and jumped in. I got a few photos, then started up the bank to put the camera back. Not paying attention, I slipped on a sandy rock, and went down hard on my knee on the rough granite. It didn’t hurt terribly, but I knew it was going to look bad. Sure enough, I’d scratched my knee up pretty good and was making a bleeding mess. Although inconvenient, it wasn’t too distracting from an otherwise perfect time at the creek. 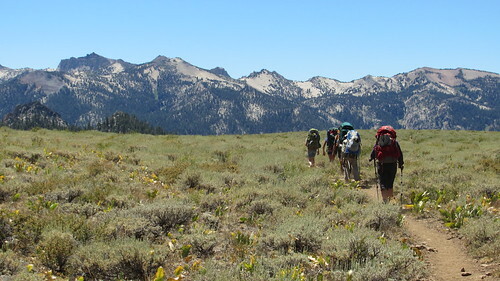 After a mostly relaxing time at the creek, it was time to load up and hike over the pass. 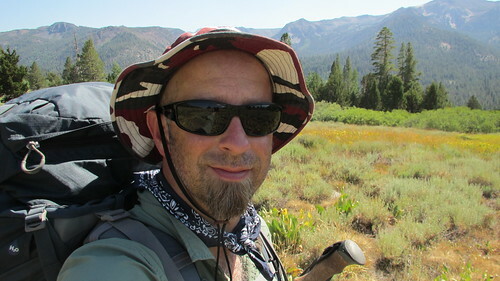 It was a hot day, and the coolness of the creek faded pretty quickly as we switchbacked up the climb. 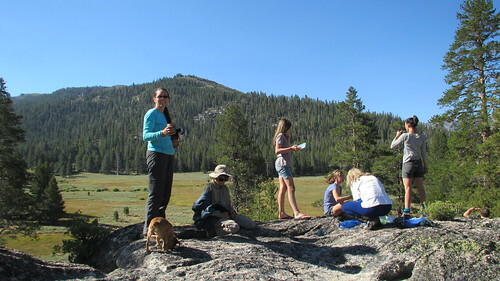 By the time we got down to Coyote Valley, Mary and Shannon were already off scouting for a campsite. They found us a nice spot up on top of a granite hill, overlooking the valley on both sides. 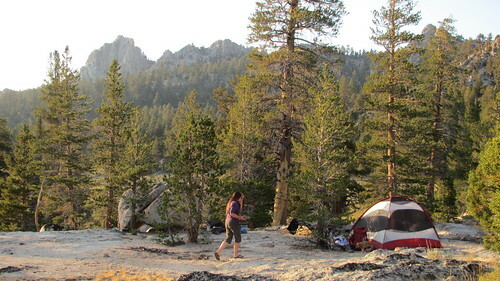 Although mostly granite, there were smooth sandy spots here and there, just the right size for a tent. Kristy and I setup our tent, but everyone else decided to sleep out under the stars on just the ground cloths, our son included. 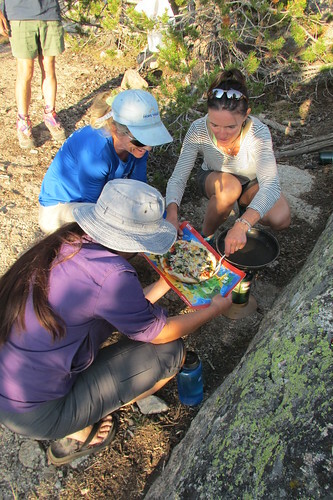 Kristy, Mary, and Shannon carefully move a Backcountry Pizza! It was clean out the bear vaults night, an attempt to eat up everything that wouldn’t need to be carried for the hike out the next day. We cooked up the last of our macaroni and cheese, and enjoyed more salami, cheese, and jerky. It was the Hataway’s night to cook for the group, and Shannon had brought stuff to make pizza. Dough was mixed and kneaded in Ziploc bags and allowed to rise a bit. Pizzas were cooked in a pan over a camp stove, and a special cover was placed over the pan to hold in the heat. It was strange to smell pizza cooking out in the middle of nowhere. If only there would have been some beer to go with it! Everyone enjoyed the feast that night. There just didn’t seem to be enough wine or tequila left though. My leg had stopped bleeding by then, but it was starting to attract flies. Gross. 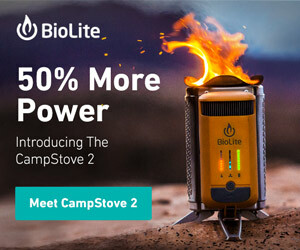 It was also getting difficult to do any camp chores. I realized just how much I had to kneel to do anything, and anytime I did, it stretched the wounds. We borrowed some first-aid supplies and used some of our own smaller band-aids to get it all cleaned and bandaged up. It was a good learning experience, and will make me rethink my first-aid kit for the next trip. Although Kristy and I didn’t sleep out under the stars, we still made sure to peek out of the tent when it got dark. It was a beautiful night sky, free from light pollution of the moon or any city. Billions of stars including the cloudy streak of the Milky Way Galaxy. The next morning it was time to hike out to the trailhead. I was feeling tired, dirty, bug-bitten, and just about done. 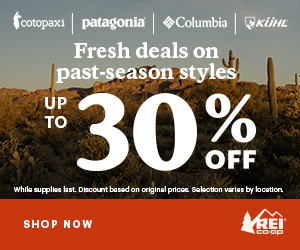 I like to think of myself as pretty rugged, but I found myself wondering how thru-hikers do it, staying out for weeks on the trail. I guess I just needed more time to go completely feral. That would not be on this trip though. Strong coffee and a good breakfast brought me back to life somewhat. Again, the scale of my map was a little deceiving. What looked like an easy pass on the map turned out to be a pretty tiring climb up over to Corral Valley. Thankfully there were some nice distractions along the way. 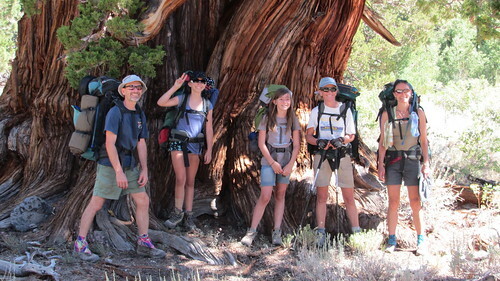 A grove of enormous junipers growing on the west slope caused us to stop and marvel. 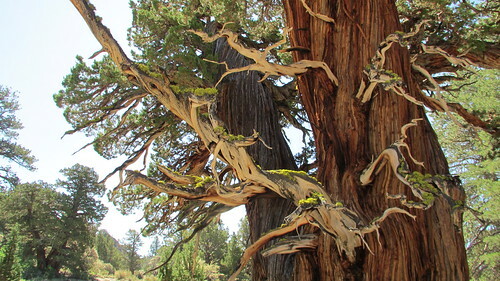 The trunks were enormous, and the branches coming off the main trunk looked like big trees all on their own. I have no idea how old they were, but the years have to be measured in the hundreds I suppose. Water Break in Corral Valley dead ahead! One last break was taken in Corral Valley. The little creek here was still barely flowing, but provided everyone with lots of cold, thirst-quenching water. 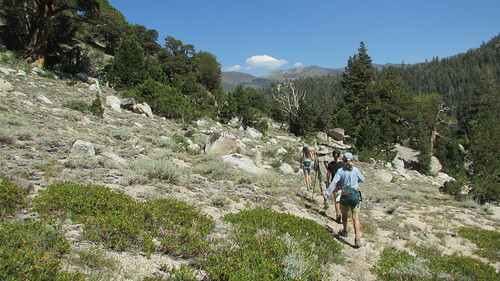 After the last water stop, we climbed the long trail up out of Corral Valley, back up to the Driveway Trail and the stoneboy. At the top of the climb, we could smell smoke, and the skies were hazy to the west. A wild fire burning somewhere off in the distance. 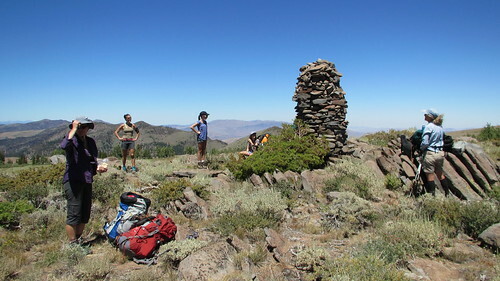 A dust devil descended on us at the top of the ridge, making us scrunch up our eyes and hold onto our hats. It was if the mountain was saying, “There, are you tired and dirty enough now?”. We made our final descent back to the trailhead. The rest of the group was ahead of us and made it to the vehicles first. We made the dogs walk the final stretch, their pace slow and tired just like ours. When we rounded the last corner and came into view of the others, the rest of the group cheered. I’m certain the dogs knew what this meant, and they held their heads high and trotted proudly for a final parade. There was just one thing left to do. Something that was mentioned often over the last few days. A trip to Walker Burger at the bottom of the hill for burgers, fries, and ice cream! Another well deserved feast before returning to Carson City. More photos of this hike can be found on Flickr HERE. Great trip report! I fell on the trail just this past weekend and banged up my knee too! Sheesh!